MYTH ONE: Vegans are pale, weak, and unhealthy because their diet lacks protein and other vital nutrients. 68.6% of respondents noted they got healthier after starting a 100% plant-based diet, yet only 1.6% said their health declined. 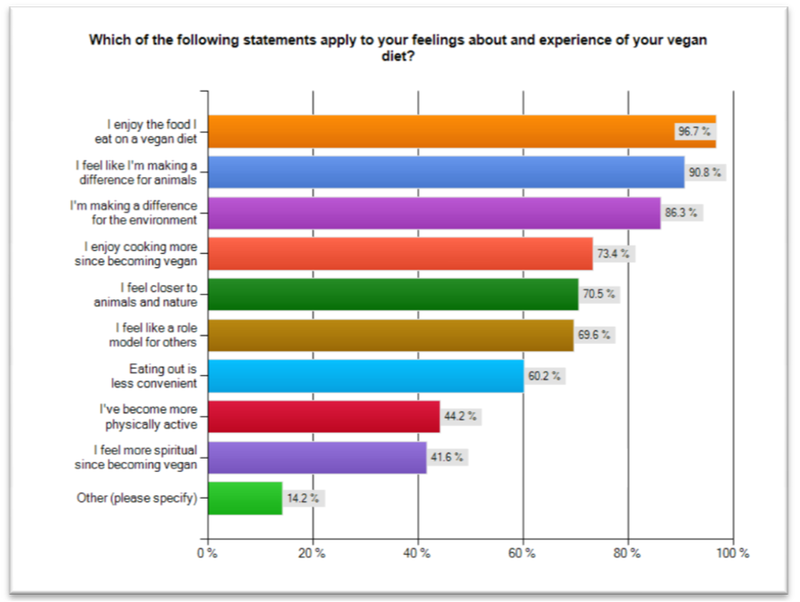 Most of the other respondents had excellent health before beginning a plant-based eating plan, and answered that their health continued at that same desirable level. 64.3% rate improving or maintaining health as a very important reason to remain vegan. who said their energy level decreased. 44.2% enjoyed increased physical activity after adopting a vegan diet. MYTH TWO. A vegan diet has too many “carbs” to be effective for weight loss. 42.1% of respondents lost weight they wanted to lose after going plant-based. Another 36.3% started at their ideal weight – and stayed there. Only 5.3% stated they gained weight after starting a vegan diet. 73.4% enjoy cooking more since going animal-free. This is important for weight loss because dieters generally have better control over food ingredients and the amount they eat when they cook themselves. MYTH THREE. A vegan diet is boring. 96.7% of respondents enjoy the food they eat on a vegan diet. 94.4% intend to stay on a 100% plant-based diet for the rest of their life. MYTH FOUR. A vegan diet is all about deprivation and lower quality of life. Again, just about every respondent enjoyed their food and virtually all intend to stay on their eating plan forever. Plant-based eaters indicated other rewards of their diet, including enjoying cooking more (73.4%), making a difference for animals (90.8%) and the environment (86.3%), feeling closer to animals and nature (70.5%), helping others by being a good role model (69.6%), and feeling more spiritual (41.6%). MYTH FIVE. A vegan diet requires a high level of discipline and is difficult to stick to in the long-run. According to 64.5% of respondents, transitioning to a plant-based diet required some effort. 10.3% said it took a lot of effort, while 24.9% noted the transition was effortless for them. Over time, not much discipline is required to remain vegan; 61.2% observe staying on a vegan diet on an ongoing basis is effortless. Only 3.2% say it takes a lot of effort. The percentage who find staying vegan effortless rises the longer people stay on a plant- based diet. MYTH SIX. Vegans can’t enjoy eating out or other social get-togethers. While 60.2% indicate eating out is less convenient, many respondents wrote in the strategies they have developed to overcome this. The most common reaction that vegans see when someone learns they are animal-free is curiosity, followed by surprise and willingness to accommodate. These responses can build social bonds. Download the pdf of the full study report. This content is copyright protected. No permission is required to publish the title and/or an excerpt of this article on another website as long as the excerpt contains a link back to this page, clearly indicating that the full article can be read here. To obtain permission to republish this article in its entirety, please contact the editor. ← Still time to enter!